About once a week, I make some version of potato soup - especially in the chillier months of the year. It's one of my kids' favorite things to eat. But, truth be told ... I, personally, get rather bored with my basic version, so I often try switching things up a bit. 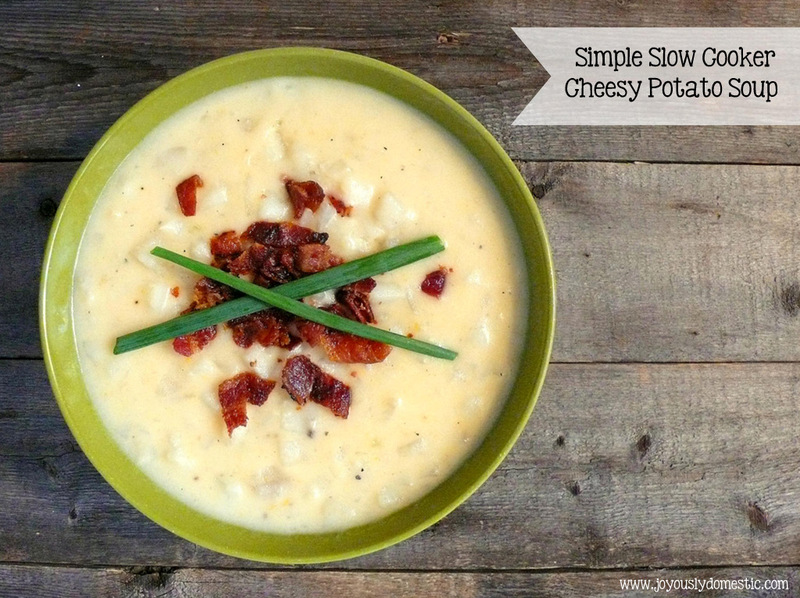 A couple of my favorite potato soup variations? My Chipotle and Chicken Corn Chowder (its base ingredients are potatoes and corn) and my Slow Cooker Potato, Sausage and Sweet Corn Chowder. My children, however, prefer just a simple, basic potato soup. I like this version because it's made in the slow cooker and the ingredient list is a short one. I often peel and dice my potatoes the evening before. (Peeling and dicing potatoes at 7:00 a.m. is not my idea of fun!) I store them covered in cold water in the fridge, then drain them in the morning just before starting the soup. The bacon can, also, be cooked the evening before. Just reheat it between two paper towels briefly when you're ready to serve the soup, then chop it up. NOTE: This soup would, also, be fabulous with the addition of corn added in. Combine the potatoes, stock, onion and celery in the insert of a slow cooker. Lid and cook on low for about for 7 - 8 hours. During the final thirty minutes of cooking, whisk together the milk and flour in a small bowl until no lumps remain. Stir into the soup. Set slow cooker to high and cook for an additional 30 minutes (or until soup has slightly thickened). Taste. Season with salt and pepper as needed. Stir in the cheese and cook a little longer until cheese has fully melted.